K2 is a leading business software company with five offices and more than 500 employees across the globe. The company aims to liberate people from slow, broken processes and existing legacy systems, transforming the old into smarter, agile solutions. K2 was founded in 1998 in Johannesburg, South Africa by two young software developers who had a vision to make process automation easy and change how business is done. Since then, K2 has grown into an award-winning business application software company. The company’s business applications and tools help users create successful solutions and increase agility. More than 1.5 million users in over 84 countries, including 30% of the Fortune 100, are using K2 to reduce risk, save money, and increase revenue. The company has strong financial backing, with more than $150 million in recent investments. 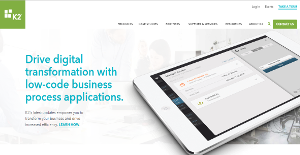 K2 helps companies digitally transform manual, paper-based processes into robust business applications. With K2, companies can minimize their IT backlog by enabling tech-savvy business users to build, run and deploy low-code apps that are agile, scalable, and reusable. Automate workflows that can accelerate your business — instead of holding you back or slowing you down. Build apps that incorporate intuitive forms and workflows to impact strategy, innovate processes, and enhance efficiency. Use visual, drag-and-drop designers to create forms, workflows, and reports that integrate with your line-of-business and data systems. Work smarter, increase agility, and accelerate business. Use K2’s drag-and-drop visual designers to create rich user experiences and connect seamlessly anytime, anywhere. Creating an application with K2’s reusable components enables you to optimize business processes — from basic task routing to complex workflows — with millions of transactions across multiple systems and thousands of users. Whether you want a solution in the cloud or on premises, with little code or no code, K2 provides business process application solutions that can adjust to all of your business needs. Each business has its own characteristics, and may require a particular type of IT Development Software solution that will be adjusted to their company size, type of customers and staff and even specific industry they cater to. You should not count on getting a perfect app that will work for every company no matter what their history is. It may be a good idea to read a few K2 reviews first and even then you should remember what the service is intended to do for your business and your staff. Do you require a simple and straightforward solution with just elementary functions? Will you really make use of the advanced functionalities required by experts and big enterprises? Are there any specific features that are especially useful for the industry you work in? If you ask yourself these questions it will be much easier to get a reliable app that will fit your budget. How Much Does K2 Cost? K2 offers different enterprise pricing models that accommodate both on premises and cloud deployment products. Please contact the vendor for more details, and ask for a quote tailored to your business. We realize that when you make a decision to buy IT Development Software it’s important not only to see how experts evaluate it in their reviews, but also to find out if the real people and companies that buy it are actually satisfied with the product. That’s why we’ve created our behavior-based Customer Satisfaction Algorithm™ that gathers customer reviews, comments and K2 reviews across a wide range of social media sites. The data is then presented in an easy to digest form showing how many people had positive and negative experience with K2. With that information at hand you should be equipped to make an informed buying decision that you won’t regret. What are K2 pricing details? What integrations are available for K2? You can integrate K2 easily with leading solutions such as Microsoft SharePoint, Microsoft SharePoint Online, Microsoft Dynamics CRM, DocuSign and more – no code required. If you need more information about K2 or you simply have a question let us know what you need and we’ll forward your request directly to the vendor.